Tiger Woods has admitted his short game and his heart greatly helped in scrambling his way to a round of 70 on day three of the Farmers Insurance Open. Woods teed-up in the $US 6.9m event having won seven prior Farmers Insurance Open titles and the 2008 U.S. Open virtually on one leg. But Woods had not broken 70 in his past nine rounds on the clifftop course overlooking the Pacific Ocean and that’s now 10 loops leaving the current World No. 647 at 3-under in total and sharing 38th place. Sweden's Alex Noren, 35 birdied two of his closing three holes in a score of 69 to move to the lead by one shot at 11-under par. Woods third round was a mix of four birdies and two bogeys while he continued struggling with the driver hitting just three fairways – his eighth, 11th and 14th holes. Woods arrived on his first tee to a third straight ‘Tigermania-like” reception but soon had spectators scurrying with wayward drives at his first and third holes respectively landing left and right of the South Course fairways. He had dropped a first shot at his second hole and again scrambled well to birdie his third ahead of another wild drive right off the 13th or the fourth hole of his round but then walking off with a second birdie. For the next 14 holes, Woods did the late Seve Ballesteros proud continuing to scramble his way around the course. Woods then produced the biggest roar of his round holing a 12-foot birdie at his ninth before a fourth birdie of the day at his 15th to move to two-under, and with this fourth birdie of his sandwiched among eight inward half pars. "My round was gross," said Woods. "I was fighting and grinding and I tried as hard as I possibly could out there. I didn't have much, but I fought to put up a score and made some good putts. "The only thing I had was my short-game and my heart and that got me through today. "I was grinding hard out there and trying to miss the hole on the correct side as I know I didn't have it and I think I did that for most of the day. "The thing is the biggest adjustment I've had to make this week is that my feels are all off as they're all different now. Woods said his short game and heart got him through the third round. "Playing at home was one thing and I now different and playing then I was in the Bahamas last month and why that is, I don't know. "So that is something I am going to have to get used to and what are my 'feels' for certain shots now in going forward. I've learned a lot from the Bahamas and I am trying to learn more this week. "But hey, I have another day tomorrow and another day to follow the process of trying to build my way back up and I am looking forward to it. 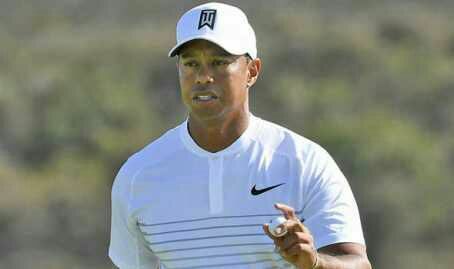 "If there has been one huge positive over the three rounds and that is Woods is clearly back to 100% fitness after last year undergoing a fourth back surgery. Nick Faldo, commentating for CBS TV, remarked: “Physically he looks great and he’s given that spine of his has had a real workout this week.